Encapsulates a Bitmap graphic that can be displayed on the BlackBerry device. When constructing a bitmap object, you have the option to specify the type of encoding used. To retrieve raw image data from a specified region of a bitmap and store the data in an integer array, invoke Bitmap.getARGB(). Applications can then manipulate the raw image data directly. Initialize an integer array, and then invoke Bitmap.getARGB() to store the raw image data of the new or predefined bitmap in the integer array. Provides additional information relevant for PNG bitmap graphics. 8-bit Alpha Channel type identifier. Deprecated. use a rowwise format and then perform a rotation. Predefined bitmap used for alert dialogs. Predefined bitmap used for busy cursors. Predefined bitmap used for information dialogs. Predefined bitmap used for query dialogs. Deprecated. If possible, use the default type (i.e. don't specify a format when creating a Bitmap); otherwise, use ROWWISE_32BIT_XRGB8888. This format, while still supported, has much lower performance than ROWWISE_32BIT_XRGB8888. This bitmap scaling option marks that scaling should proceed without preserving aspect ratio. This bitmap scaling option marks that scaling is done with preserving the aspect ratio. The hexadecimal representation of pure black. The hexadecimal representation of pure white. Constructs a blank bitmap object. Constructs a blank bitmap object of a specific type. Deprecated. Use setRGB565 or setARGB to initialize the Bitmap data. Create an 8bpp alpha channel on this Bitmap (if one doesn't already exist). Creates a bitmap from image data. Creates a bitmap from provided PNG format data. Tests if provided bitmap is equal to this bitmap. Gets raw ARGB data from region of this Bitmap and stores it in the provided array. Creates a bitmap from provided name resource. Creates a bitmap from provided named resource found in module. Get the bits per pixel of the bitmap. Query the default Bitmap type for the device. Retrieves one of the predefined system bitmaps. Gets RGB 565 data from a region of this Bitmap and stores it in the provided byte array (Big Endian format), i.e. byte = RRRRRGGG, byte = GGGBBBBB. Tests whether there is an alpha map associated with this Bitmap. Indicates whether the Bitmap object is read-only. Compares this Bitmap to another for differences. Scales the rectangular area in this bitmap and stores the result in the rectangular area in the provided bitmap. Scales this bitmap and stores the result in the provided bitmap. Scales this bitmap and stores the result in the provided bitmap with an option to preserve the aspect ratio. Changes the bitmap to match the data in the provided array. Sets the bitmap color data for a specified rectangular region using the provided raw 16-bit RGB 565 data array. 1-bit Alpha Channel type identifier. Used as an input to createAlpha to create a 1-bit alpha channel (1 bit opacity per pixel). Used as an input to createAlpha to create an 8-bit alpha channel (8 bit opacity per pixel). 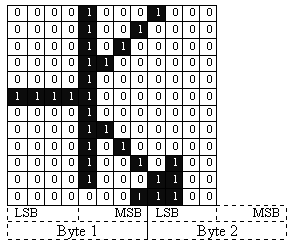 This bitmap type stores data in pixel wide columns in successive bytes. Each bit in a byte is a pixel value: 0 is white and 1 is black. Uppermost pixels are in the less significant bits within a byte, and lower numbered bytes contain the uppermost pixels within a column. This bitmap type stores data in rows, with 4 bytes per pixel. The first byte represents the alpha value, the second red, the third green, and the fourth blue. This bitmap type stores data in rows, with 4 bytes per pixel, premultiplied by alpha. The first byte represents the alpha value, the second (alpha * red), the third (alpha * green), and the fourth (alpha * blue). This bitmap type stores data in rows, with 4 bytes per pixel. The first byte is ignored, the second byte represents red, the third green, and the fourth blue. This bitmap type stores data in rows, with 2 bytes per pixel. A 0 is black and a 0xffff (65535) is white. Each row is padded (if necessary) so that each row is a multiple of 4 bytes in width. This bitmap type stores data in rows, with 1 bit per pixel. A 0 is black and 1 is white. Each row is a multiple of 4 bytes. Leftmost pixels are in the less significant bits within a byte, and lower numbered bytes contain the leftmost pixels within a row. Lanczos interpolation is considered to give best image quality, but it is slower then Bitmap.FILTER_BOX and Bitmap.FILTER_BILINEAR. Lanczos interpolation produces the sharpest images, but may also introduce some ringing artifacts. Box interpolation filter. Also known as mean filter, averaging filter, or smoothing filter. It may produce blurry images and is considered to have poor visual results. However it has fast computation. Bilinear filter produces good results for image reduction and enlargement, but displays sharp transition lines. Very fast computation. This filter is popular in rendering of the previews. This bitmap scaling option marks that scaling should proceed without preserving aspect ratio. The source bitmap is fit to the dimensions of the destination bitmap. 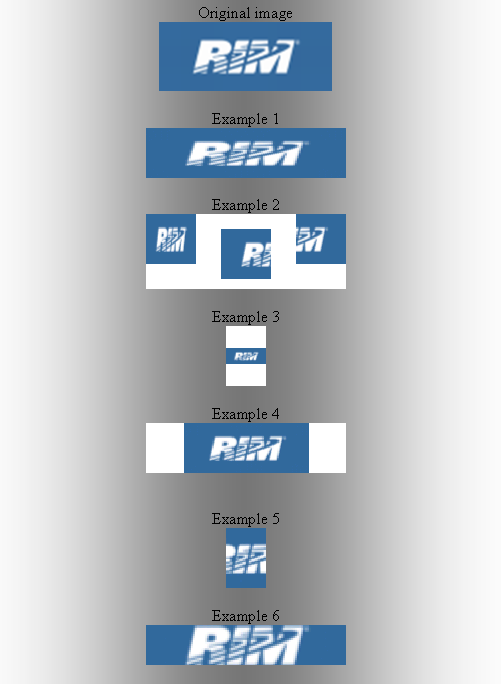 This bitmap scaling option marks that scaling is done with preserving the aspect ratio. The source bitmap is fit to the dimensions of the destination bitmap and a part of destination bitmap remains unchanged. This bitmap scaling option marks that scaling is done with preserving the aspect ratio. 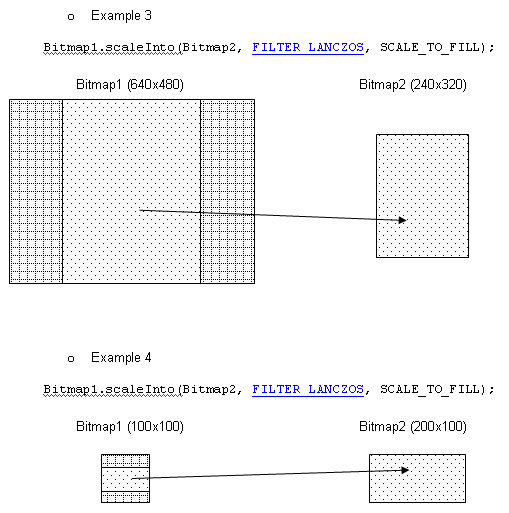 The source bitmap fills the destination bitmap completely and outstanding parts of the source bitmap are not copied to the destination bitmap. width - Width of this bitmap. height - Height of this bitmap. IllegalArgumentException - Thrown if width or height parameters are invalid. type - Type of this bitmap. IllegalArgumentException - Thrown if the width, height, or the type is invalid. Constructs a new bitmap of a specific type from existing data. Note that this method makes a copy of your provided bitmap data. This method requires that the provided data be consistent with the specified bitmap type and dimensions. This includes any necessary padding to ensure that stride breaks occur on DWORD (4-byte) boundaries. data - Data from which to build this bitmap. IllegalArgumentException - Thrown if the length of the data array is incorrect, the width or height are invalid, or the type is invalid. The type of the natural device Bitmap. Gets raw ARGB data from region of this Bitmap and stores it in the provided array. Alpha of 0xFF is opaque, 0x00 is transparent. argbData - Array of data where the ARGB data will be stored. Each pixel is stored in 0xAARRGGBB format. offset - Offset into the data to start writing to. scanLength - Width of a scanline within the data array. x - Left edge of rectangle to copy from. y - Top edge of the rectangle to copy from. width - Width of the rectangle to copy from. height - Height of the rectangle to copy from. preAlpha - if true multiply the color channels by alpha. NullPointerException - Thrown if 'argbData' is null. ArrayIndexOutOfBoundsException - Thrown if the data parameters are invalid. rgbData - Array of data where the 16-bit RGB 565 data will be stored in Big Endian format. scanLength - Width of a scanline (in bytes) within the data array. NullPointerException - Thrown if 'rgbData' is null. IllegalArgumentException - Thrown if the data parameters are invalid. The RGB565 data is provided in a byte array (Big Endian format), i.e. byte = RRRRRGGG, byte = GGGBBBBB. For bitmaps of type other than Bitmap.ROWWISE_16BIT_COLOR this method first converts the RGB565 data to this bitmap's type. The source data must be sufficient to provide data for the specified destination region. The destination region must be fully contained within the current bitmap. rgbData - Array of source 16-bit RGB 565 data will be stored in Big Endian format. offset - Starting offset (bytes) for the source data. x - Left edge of destination rectangle. y - Top edge of the destination rectangle. width - Width of the destination rectangle. height - Height of the destination rectangle. Height of this bitmap in pixels. Scales this bitmap and stores the result in the provided bitmap. The destination Bitmap's size is used to determine the scaling factor. NullPointerException - Thrown if 'dst' is null. IllegalArgumentException - Thrown if the destination bitmap is read-only. IllegalArgumentException - Thrown if illegal filter type is specified. // Example 3. Scale preserving the aspect ratio. Fit horizontally. // Example 4. Scale preserving the aspect ratio. Fit vertically. // Example 5. Scale preserving the aspect ratio. Fill vertically. // Example 6. Scale preserving the aspect ratio. Fill horizontally. 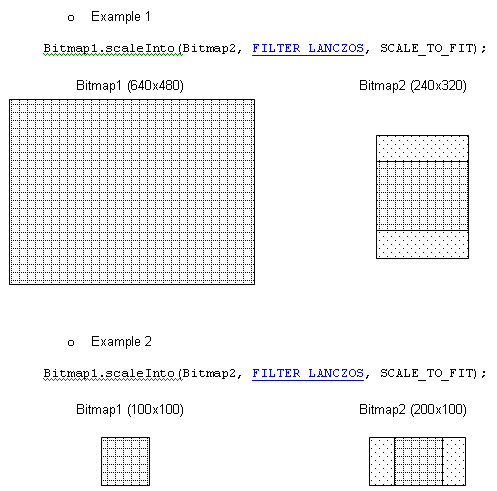 Bitmap.FILTER_LANCZOS - Lanczos interpolation is considered to give best image quality, but it is the slowest out the other three interpolation algorithms. Lanczos interpolation produces the sharpest images, but may also introduce some ringing artifacts. Bitmap.FILTER_BOX - Box filter (aka mean filter, averaging filter, and smoothing filter) produces blurry images and is considered to have poor visual results. Very fast computation. Bitmap.FILTER_BILINEAR - Bilinear filter produces good results for image reduction and enlargement, but displays sharp transition lines. Very fast computation. This filter is popular in rendering of the previews. Visual result of each filter looks different when applied to various types of images. Therefore, it is up to the user to choose suitable interpolation and make speed vs. quality trade off. Scales this bitmap and stores the result in the provided bitmap with an option to preserve the aspect ratio. The destination Bitmap's size is used to determine the scaling factor. IllegalArgumentException - Thrown if the preserveAspectRatio parameter is invalid. SCALE_TO_FIT � With this option the aspect ratio is preserved. In case the source and the output bitmaps have different aspect ratios the scale is MIN((height_out/height_in), (width_out/width_in)). In other words, it will scale to match the smallest destination dimension (height or width). The source bitmap data is rendered in the center of the output bitmap. 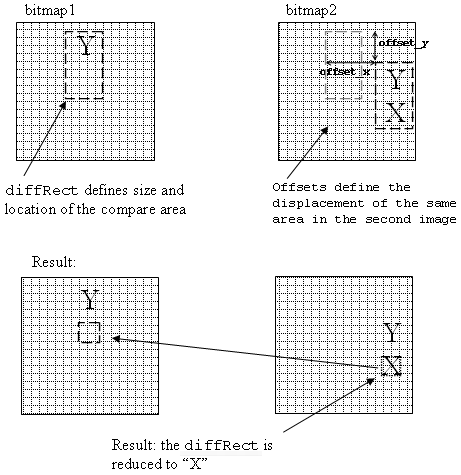 The source bitmap is fit to the dimensions of the destination bitmap and a part of destination bitmap remains unchanged. SCALE_TO_FILL � With this option the aspect ratio is preserved. In case the source and the output bitmaps have different aspect ratios the scale is MAX((height_out/height_in), (width_out/width_in)). In other words, it will scale to match the largest destination dimension (height or width). The source bitmap fills the destination bitmap completely and outstanding parts of the source bitmap are not copied to the destination bitmap. Scales the rectangular area in this bitmap and stores the result in the rectangular area in the provided bitmap. If "copy" or "paste" areas exceed boundaries of the source or destination bitmaps they are automatically cut to the boundaries. srcLeft - X coordinate of the top left corner of the area to be copied from the source bitmap. srcTop - Y coordinate of the top left corner of the area to be copied from the source bitmap. srcWidth - Width of the area to be copied from the source bitmap. srcHeight - Height of the area to be copied from the source bitmap. dst - Destination bitmap that receives scaled copy of the source bitmap. dstLeft - X coordinate of the top left corner of the area to be copied to the destination bitmap. dstTop - Y coordinate of the top left corner of the area to be copied to the destination bitmap. dstWidth - Width of the area to be copied to the destination bitmap. dstHeight - Height of the area to be copied to the destination bitmap. The interpolation is required to eliminate blocky appearance of rescaled bitmap due to change in the number of pixels and hence the digital sample rate. Interpolation resamples digital data removing blocky appearance. Lanczos interpolation is considered to give best image quality, but it is the slowest out the other three interpolation algorithms. Lanczos interpolation produces the sharpest images, but may also introduce some ringing artifacts. Box filter (aka mean filter, averaging filter, and smoothing filter) produces blurry images and is considered to have poor visual results. Very fast computation. Width of this bitmap in pixels. Readonly bitmaps cannot be drawn to by attaching a Graphics object. True if the Bitmap object is writable, false if it is read-only. Changes the bitmap to match the data in the provided array. Alpha of 0xFF is opaque, 0x00 is transparent. data - Array of ARGB data that will be used as the new bitmap data. Each pixel is stored in 0xAARRGGBB format. left - Start x position in bitmap for ARGB data. top - Start y position in bitmap for ARGB data. width - Width of ARGB data. height - Height of ARGB data. NullPointerException - if 'data' is null. offset - Start of PNG data in the passed byte array. length - Length of PNG data in the passed byte array: -1 means to the end of the data array. OutOfMemoryError - Thrown if insufficient memory to process the PNG data into a bitmap. NullPointerException - Thrown if the png parameter is null. IllegalArgumentException - Thrown if the png parameter is invalid, or offset or length are invalid. Creates a bitmap from image data. See EncodedImage.getSupportedMIMETypes to determine what image formats are supported. The image can be optionally downscaled during decoding by an integer scale factor. offset - Start of image data in the passed byte array. length - Length of image data in the passed byte array: -1 means to the end of the data array. scale - Integer downscale factor: 1 means no scaling. OutOfMemoryError - If insufficient memory to process the image data into a bitmap. NullPointerException - If the bytes parameter is null. IllegalArgumentException - If the bytes parameter is invalid, offset or length are invalid. ArithmeticException - is scale is 0. A bitmap is equal to another if the types are the same, the dimensions are the same, and the data is the same. obj - The object to compare to this bitmap. True if your obj parameter is equivalent to this bitmap; otherwise, false. Compares this Bitmap to another for differences. This comparison is done within the provided XYRect and can be offset within the second bitmap to an alternate position. This method finds the minimal difference between the bitmaps in the defined area. The provided XYRect is modified with the new coordinates representing this area. An empty XYRect represents no difference between the two bitmaps within the given area. NullPointerException - Thrown if diffRect or bmp2 is null. IllegalArgumentException - Thrown if bitmap height or width is zero. IllegalArgumentException - Thrown if diffRect height or width is zero. IllegalArgumentException - Thrown if the diffRect is out of this bitmap bounds. IllegalArgumentException - Thrown if the diffRect that was offset by values offset_x and offset_y is out of bmp2 bitmap bounds. True if this Bitmap has transparency information. Create an 8bpp alpha map associated with this Bitmap. 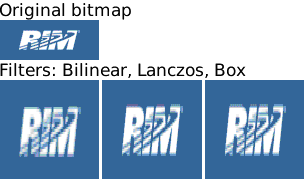 Alpha maps can only be set for Bitmaps of type Bitmap.ROWWISE_16BIT_COLOR. IllegalStateException - If this Bitmap is not of type Bitmap.ROWWISE_16BIT_COLOR. This method looks for the resource in both the .cod file that called this method and any .cod files that it relies on. The resource files are automatically generated by the compiler when a new graphic (PNG, GIF, or, JPG) is added to a project. module - Name of the module containing the bitmap resource. If not specified, the name of the calling module is used. name - Name of the bitmap resource. New Bitmap object, or null if this method couldn't find your named resource. predefinedBitmap - System graphic to retrieve. If you specify a value not currently assigned to a standard system bitmap, this method returns the Bitmap.INFORMATION bitmap. New Bitmap object equivalent to the system graphic you specify.